Not too long ago someone popped up on Facebook that I hadn’t seen before and we friend-ed each other and sent along hello notes to see how life was going since we’d last seen each other in high school. You know how it goes, “How’s life? We should catch up the next time you are in town… cute kids, etc…” I thought nothing more of it until I started reading his status updates and they made me realize how life had taken us down very different roads, like laughably different. And as is bound to happen, I thought about how these things occur… how two people end high school both as class officers (he being our president and me being treasurer) and almost twenty years later in the span of a week he is having a private dinner with the President of the United States and partying at the same event as Jay-Z and Beyonce [both true stories and not exaggerations] and I am carting my kids around to swimming lessons and camping [also true and far less glamorous]. And that is not at all to say that I would want his life, or am jealous of where he is and what he is doing (okay, a little “jealous” because, Sasha Fierce people), but it is really to note how anything is possible in life. Anything. And the choices we make in what school to go to, who are friends are, where to live and what priorities to have make the difference in where we end up – no matter where we start out. Two roads indeed diverge and we choose one or the other at every juncture. Yes, I had that momentary twinge of “wouldn’t it be nice to have dinner with the President?” Because, hello, he is THE president and I am only human. But just as quickly as that thought came another one reminded me that his life wouldn’t be the life for me. Sure I was the girl who did everything in high school but now I’m the girl who does what she wants and there is a difference. And Mike is living the life he wants and making the choices that will take him where he wants to be (which I believe I can safely say is not at swim lessons and sleeping in a tent). But different isn’t better and different isn’t worse, it is just different. So instead of maybe being a bit jealous, I can be a whole lot more happy that it takes all kinds of people to make the world go round (and be super proud of where life has taken people I knew way back when). I can also take a moment to remember that just because someone’s highlight reel on Facebook is pretty fabulous, doesn’t mean they are any happier or better off, they are just living a different life. And good for them… it gives me a glimpse into an alternate reality and it is my choice to be thankful for the reality that is my own. 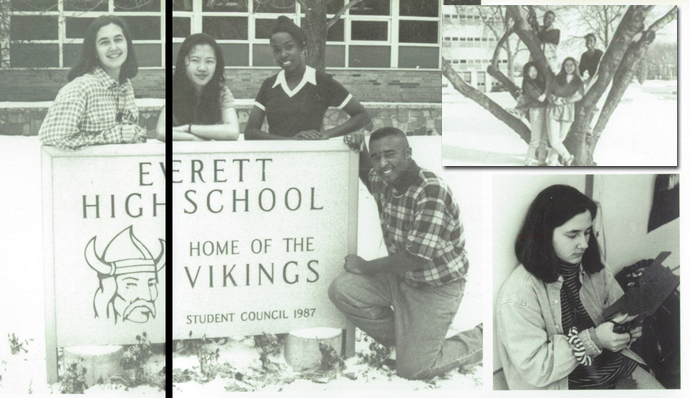 And because my search for the class officer photo also uncovered a couple other gems from the yearbook I thought I should post them here for your viewing pleasure. Above is a pic of me and my friend, Josh, decked out for the Homecoming pep rally. 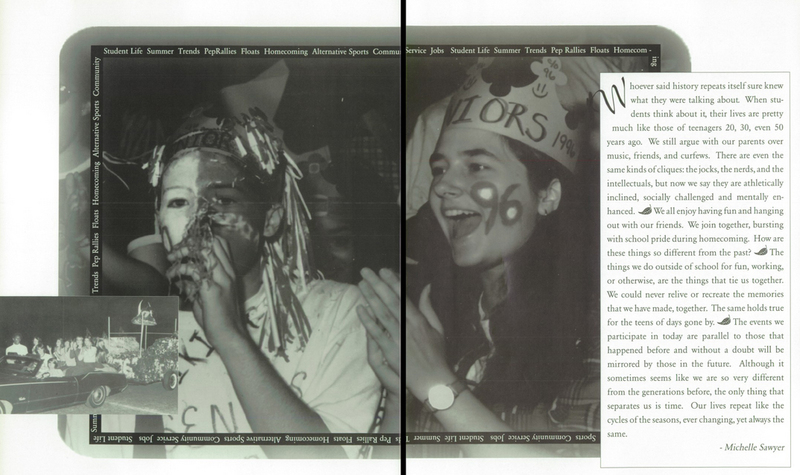 And because I was also the yearbook editor, I wrote the article that is featured on the page – I was totally that person in high school, the over-achiever. I’d be apologetic about that, but I’m not really sorry. 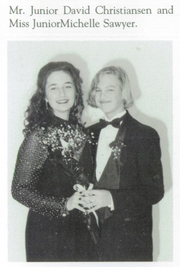 I was also the girl who was on winter homecoming court my junior year (below). And, yes, Mr. Junior has black painted nails; he’s now all grown up, married to a girl we went to high school with and has two kids. This entry was posted in Gratitude, Life in general. Bookmark the permalink. I love this and feel the need to give you an over-achiever’s fist bump. Or maybe we could make up a secret handshake? Oooh – I always respect the secret handshake… and my goodness, what I wouldn’t give to have the stamina I possessed in high school. I could have at least two more kids with that kind of energy.